Are you ready for the best time of your life? 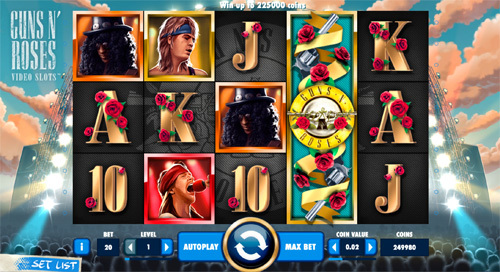 Rock out to the iconic tunes of Guns ‘n Roses while spinning your way to rocking riches! The Guns ‘n Roses video slot is loaded with bonus features such as Expanding Wilds, Legend Spins, and The Appetite for Destruction Wild. 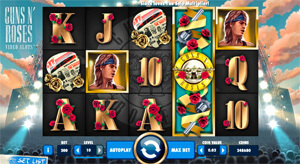 Guns ‘n Roses is a 5 reels, 3 rows and 20 bet lines video slot powered by NetENT. The slot starts with a bang and you’ll get up close and personal with the band in the little intro video. Players don’t just play this slot for the endless bonus features but also to awaken their 80’s rock spirit. The Guns ‘n Roses slot is uniquely designed and plays off like a real rock concert. Players can even look forward to an encore which in this case will be an extra bonus feature. Guns ‘n Roses are known as rock royalty and the band was first founded in Los Angeles in 1985. The band members consist of Vocalist Axl Rose, Lead Guitarist Slash, Rhythm Guitarist Izzy Stradlin, Bassist Duff Mckagan and Drummer Steven Adler. NetENT took over a year to develop this slot and it was well worth the wait. A treat for fans is that one bonus features is named after their debut album called ‘Appetite for Destruction’. The slot can be played on all devices from desktop to mobile and tablets. 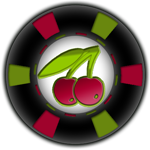 Players can spin from as little as 0.20 per spin to a maximum of 200. The coin values range from as little as 0.01 per line to 1 per line. Players also have a rockin’ chance of cashing in on up to 225,000 coins in wins! The Guns ‘n Roses slot machine is jam-packed with a variety of well-themed bonus features and each bring something different to the table. The wild of this slot is the Guns ‘n Roses slot logo and whenever it appears it expands to fill the whole reel. It can appear on all reels except reel 3 during the Appetite for Destruction Wild feature. It substitutes all symbols except the Bonus symbols. During the main game you can activate three features at random: Legend Spins, the Appetite for Destruction Wild and the Solo multiplier. The legend spins can reward players with up to three free re-spins with stacked wilds. Any of the band members can appear stacked during the re-spins. Bonus symbols will not appear in this feature. The Appetite for Destruction Wild is an overlay wild in the shape of a cross that can appear in one of three possible reel positions. It substitutes for all other symbols and can’t appear during any of the other bonus games and vice versa. This feature is definitely a favourite among players as it has proven to be quite rewarding. The Solo Multiplier feature is a random multiplier that awards between 4x and 10x to a winning bet line. It will only appear if there are three or more matching symbols in a winning bet line. The solo multiplier can only be activated for 1 winning symbol per spin excluding the wild. If three or more bonus symbols appear anywhere on reels 1, 3 and 5 during the main game it unlocks three features. To determine the feature, players have to spin the bonus wheel. Players can win up to 600 coins with the “coin win” feature. The winning amount is multiplied by the bet level and the total shown on the Bonus Wheel. The Encore Free Spins feature activates 10 Free Spins that take place after the Bonus game is complete. One of the band members will feature as an overlay stacked wild symbol on reel 2, 3 and 4. The Free Spins cannot be retriggered during the free games. 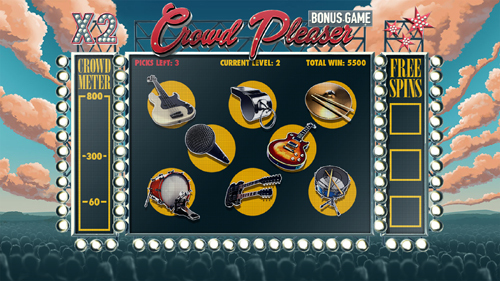 The Crowd-Pleaser is a simple ‘click me’ bonus feature with three different levels. You need to pick three symbols that award you with enough points to get to the next level. All the symbols are of course rock related. If you make it all the way to level 3 a 2x multiplier is added to your winnings. There is nothing better than starting or ending your day with a little “Sweet Child O’ Mine” jamming in the background. Especially when you get to combine great music with fabulous gameplay. While the Guns ‘n Roses slot by NetENT might be considered one of a kind there are others. NetENT has created a few slots with music themes including the peace-loving Jimi Hendrix slot. For players who prefer the calmer beats over drums and guitar, Jimi Hendrix will do the trick. NetENT also has a Motorhead video slot. Other music themed slots with a little more simplicity include NetENT’s The Groovy Sixties, The Funky Seventies and The Super Eighties. Fans will be delighted to know that Guns ‘n Roses is available on all mobile devices. The HTML5 software will ensure that the slot runs smoothly. Players still get to choose their songs of choice from the set list. Overall, the slot stays the same when making the shift from desktop to mobile. Only the button placement differs for comfort and easier gameplay. Guns ‘n Roses is all about the performance. Immerse yourself in the slot and experience the thrilling feel of attending a live concert of the Iconic rock legends! The slot offers a once in a lifetime experience. Listen to great tunes, watch the band power up winnings and stand a chance to win 225,000 coins in wins!